in collaboration with Grade 3/4 students from Queen Alexandra Elementary School. Packaging & Design: Helen Reed & Hannah Jickling. Manufactured by: East Van Roasters. Chocolate Bar: 16.5 x 6 x 1cm. Ingredients: 70% Madagascan Chocolate, lemonade wild cherry nerds, dried sour cherries, candied lemon zest. Text surveying the project by Zoë Chan. Big Rock Candy mountain is a flavor incubator and taste-making think-tank with elementary school students. The project is disseminated serially, through artist editions, printed matter and collaborative confections that inhabit various venues and address multiple audiences. Learn more about Big Rock Candy Mountain. SOUR VS SOUR is one of the works produced as part of Big Rock Candy Mountain. During 3-month engagement with a Queen Alexandra Elementary School grade 3/4 class, artists Hannah Jickling & Helen Reed taste-tested a range of flavours and developed a miscellaneous vocabulary to describe them: sounds, shapes, words, elaborate fonts, synesthetic line drawings and emojis. With visits to-and-from East Van Roasters, the group learned about single-origin, fairly traded dark chocolate and navigated its tense (and tacky) conflation with cheap candy from the gas station nearby. 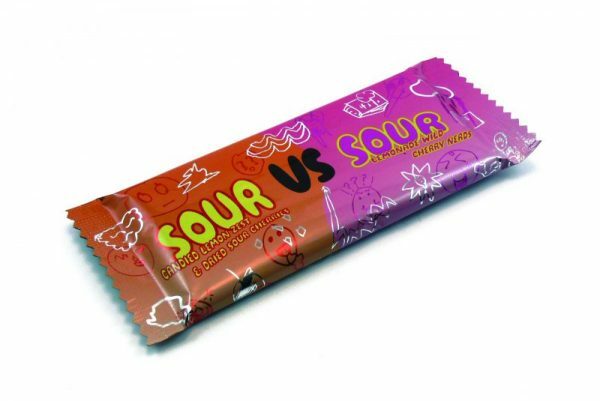 SOUR VS SOUR is a clash of the tastes we’ve learned to see in opposition: natural vs synthetic flavour, adult vs kid desires, good vs bad choices, healthy food vs economic means. As influenced by EXTREME candy marketing to kids, (and their astute observations about how it functions), SOUR VS SOUR disguises bean-to-bar food politics as campy, crinkly, candy-bar realness. In her text, Travels in Chocolate, Candy Culture, and Kid Creativity, independent curator Zoë Chan expands on ideas inherent to this project. Biggest thanks to Shelley Bolton, Brooke Lodge, Gizelle Paré and Merri Schwartz of East Van Roasters for sharing their knowledge, facilities and chocolate-making expertise in the making of the SOUR VS SOUR Chocolate Bar. Located in Vancouver’s Downtown Eastside, East Van Roasters is a non-profit initiative benefitting the women residents of the Rainier Hotel.